At the Murphy School in Dorchester, Step Into Art is a longstanding third-grade tradition. 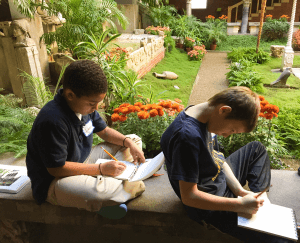 We started our third-grade partnership with the Murphy in the fall of 2009, and each year since then, upwards of 75 third graders have taken part in this program immersing students in the world of the Isabella Stewart Gardner Museum. Siblings, cousins, neighbors, classmates, eighth graders soon to graduate – all share memories from their Step Into Art experience. When I was at school for our program this past fall, I ran into Principal Courtney Sheppeck in the hall as a line of kindergartners were marching by. “They’ll be yours in a few years!” she said. At our concluding celebration in November, the third-grade ESL class invited younger students to come and see their Step Into Art poems and self-portraits, providing a glimpse of what’s ahead. I would tell next year’s 3rd graders that Step Into Art was AMAZING!!! You write poems from pictures, you go on a field trip, you check out some paintings in your classroom, and you make self-portraits, and lots of other activities! When you write poems, you write about the Courtyard, the St. George and the Dragon painting, and the El Jaleo painting. It’s lots of fun and you get to sketch in your sketchbook. It’s awesome! My favorite part was taking the picture at the end. And those are the most loved parts of my trip!!!!!!!! I will tell next year’s third graders that step into art is awesome. You get to make self portraits, you get to make poems, and I think you are going to like this one, you get to act out pictures. It is fun! The best part is that you make Who am I poems. You pick something from the museum but you can’t give it away. You need to write clues, then people need to guess who you are from the museum. I would tell next year’s third graders that everything was absolutely brilliant! I loved the who am I what am I poems, and I loved the party with the oranges, and I loved, loved, loved, the mini play! I liked them because they were all very fun and awesome! Hi new third grade students. Is this your first time here? It is!? Great!! So if I’m spoiling how awesome step into art is I’m sorry. But spoiler alert!! Step into art is really fun. 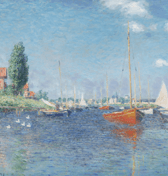 You get to sketch, make poems, and look at all these awesome paintings. You even get to make your own self portrait. I liked all of it. Step into art is the best!! I would tell next year’s 3rd grade superstars that the types of poems are awesome, seeing all of the colors in all of the paintings is awesome, and the facts you learn are awesome. The types of poems are awesome because it was new to me and it’s probably new for you. The paintings are awesome because they were so old and they have stories about them. The facts are awesome because the facts are historic and cool. I would tell next year’s third-graders to love Step Into Art because I love it. It was an amazing journey. I got to see a lot of beautiful pictures. I also got to go to the museum myself and we also got to make poems. I love Step Into Art and I know you will too.